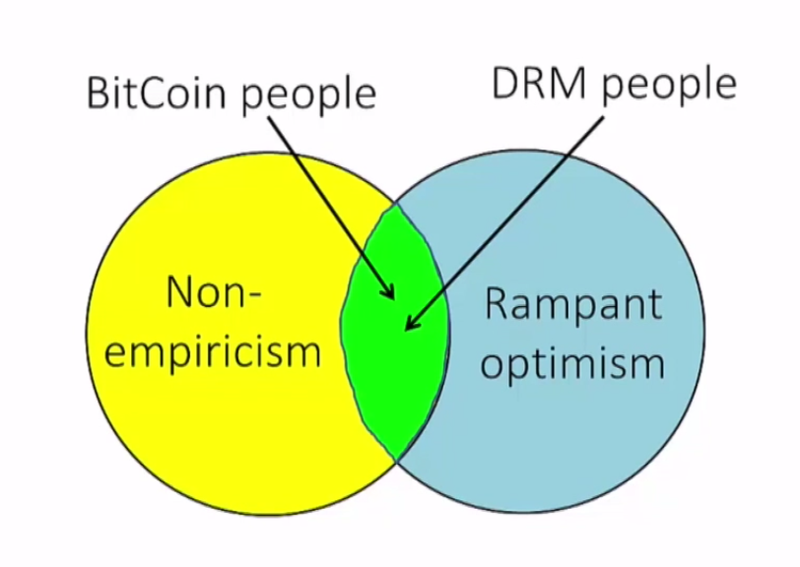 I understand the DRM part, but what empirical lessons did bitcoin miss? I find it a genuinely novel idea, hard to directly compare to previous “similar” attempts. Mostly the problems inherent to a deflationary system. * Bitcoin has been operating for 5+ years. When are we supposed to see the problems of the deflationary system come up? If that’s not enough time, why? * Guys like @socrates1024, @petertodd and others have been doing empirical testing on the small: the fact that as many people use bitcoin as use them today is empirical testing on the large since significant numbers of people have been attacking the entire attack surface. It’s simply not the case that in 2015, that the claims of bitcoin are not being empirically tested. In fact his point about ‘stolen’ bitcoin is a good deal of where the empirical testing *is*. We know what security mechanisms and services that are associated with bitcoin are and are not working well based on how much bitcoin is successfully stolen via them. But bitcoin itself has really only had about 3 exploitable problems (the berkeley db problem, the blocksize debate we’re going through right now, and a hardfork in what like 2011? ), really only the last one that was a problem at all. * We’ve known since at least 2011 that leaving bitcoins on an exchange is a *bad idea* and should only be done if you fully appreciate the risk involved. Ripple is a partial solution to that problem, but it comes with its own drawbacks. The point however is that this isn’t 2011, and we should not be treating exchanges as these secure points. * “total number of bitcoins divided by the total number of objects” that is some sloppy handwaving. Prices convey power relationships and take into account other information such as risk preferences. He’s right. It’s all caveat emptor. And yet trade happens anyway. Any theory about whether and to what extent people will trade a good that depends upon a theory of justice backing it need to be discarded or updated in light of this new evidence. * “Used to fund an assassination plot where you are the target of the assassination” Ok that’s a valid complaint. Bitcoin is not going to solve the problem of trolls and jerks. * Bitcoiners by and large know about the deflationary spiral hypothesis. The empirical data *does not match the predictions made by this hypothesis*. Bitcoiners, by and large, spend more bitcoin when bitcoin is dear relative to other currencies. * Countries don’t “need” to abandon any particular system — they do so to achieve goals and sometimes those goals have less to do with economic wellbeing as the distribution of power within a society, and within the world itself. The gold standard was flawed, and bitcoin will also be flawed. But the alternative of giving the United States’ control of the global financial system, and as much of a free pass as they got from 1971-2008 is not any better.